The last iteration of this post made the assumption that ‘gold’ Open Access meant you had to pay for it. I of all people should know that this is what us English scientists call ‘pish-posh’. It turns out that in reality, around 70% of journals indexed in the Directory of Open Access Journals (DOAJ) have zero author-facing charges. So an APC of $0. Gold does not mean you shell out gold for it. It just means it’s Open Access at the point of publication. Every time you post this, I will say that gold != APC. There is gold #openaccess w/o the author paying for it. Update the flowchart maybe? The new infographic below on how to achieve 100% Open Access now emphasises this as a key first step. Really, there is now absolutely reason for nearly every single researcher out there not to make their entire future and past research papers completely Open Access, and often for free. I’ve basically built a database that describes this worflow for every single journal in Palaeontology, as part of the development of paleorXiv. This is fairly useless though if people don’t actually use it, and take the opportunities granted to them. So I simply ask that if you’re reading this, you share this information as widely as you possibly can. What if all we end up with is 100% Open Access? Importantly, this means that researchers, and in particular those who are early-career researchers, can publish in often paywalled journals that they ‘need’ to advance their careers in the current incentive system, and still have risk-free Open Access. If we, as a research community, self-archive en masse, several things could be potentially achieved. We make the need for quasi-legal entities like SciHub and ResearchGate to become redundant. We make the world a better place for every single human being. I appreciate the flow-chart, good job. 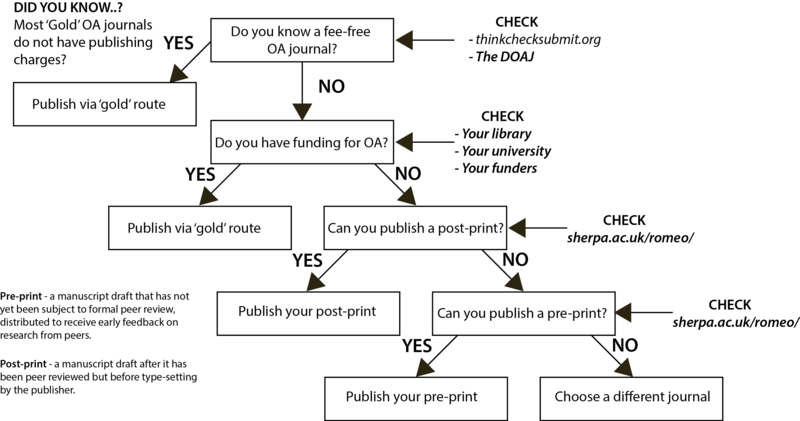 But what is the rationale to spend money on gold OA over green OA? Also, it could be argued that “choose a different journal” should be already the reaction to “Can’t publish a post-print”. Well, this is a very good question. and one only individual researchers can answer. Some want the glory, some want the OA at point of publishing, some don’t like green OA, some journals are gold OA only. There are a variety of potential reasons. It is difficult indeed to capture a cross product of all the options with individual preferences in a flow-chart. 1. Researcher identifies itself, gets a list of all papers she published with Elsevier (because they have a common policy across journals and megagiga marketshare). 2. All papers are downloaded (assume institutional access). 3. The PDFs are stripped of the Elsevier layout, fonts, logo, etc (I guess that is the hard part), so that they are indistinguishable from an “author manuscript”. 5. Everything is uploaded to institutional repository (if that is well-indexed) or any other non-commercial one and the appropriate embargo is set. I guess that would make quite an impact and be completely legal at the same time. Hey Elsevier, I know you are reading this blog, that’s OK with you? Yes, I agree. This flow chart does not capture the whole diversity of possible approaches. But it does make a good guide for many cases. And yes, agree that there is still the issue with historical content. The thing is, most researchers will have the pre-post print versions of manuscripts already on their hard-drives. You can probably skip steps 1-3 at a personal level. I’ve seen many researchers recently doing this, and it’s great! It can be difficult, especially for pre-digital papers, but is definitely possible on a massive scale. The tools and platforms exist, it’s the awareness that is often lacking, I feel. Well not so sure. Awareness is important, but then there is also inertia. I got the idea because I wanted to do exactly this with my meagre collection of papers. And the manuscripts surely are on a personal harddrive. Or maybe not. Doesn’t matter, I have no idea where that harddrive from 2002 is now, anyway. I believe a little tech can help a lot to turn awareness into action. Awareness is one of the things we can do to help reduce inertia. The tech exists, although if you’ve lost a hard-drive then there’s probably more than just tech issues..! I have lost many harddrives in the last 15 years. Any attempt to put OA into practice can not rely on personal harddrives or individual long-term personal data management. Most efforts now go into getting people to put their postprint immediately after acceptance into institutional repositories and that is good. But it doesn’t help with the vast majority of research that was published in the past.